Size: 59 x 47cm (including white painted frame). Image area 42 x 29cm. Pay in interest-free payments over ten months – £82.50 a month. Beautiful and unique fused glass painting ‘Colour and Light’ by Jane Reeves certainly captures the essence of the north coast of Cornwall. Dive into mesmerising splashes of sea green, turquoise and limitless shades of blue. 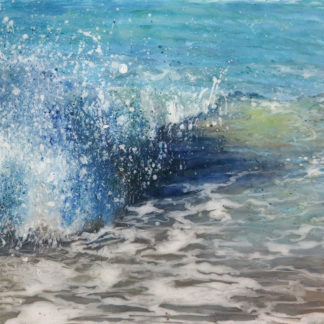 The action of sea drawing uo the golden sand of Cornwall. Like the glisten of sunshine against crashing waves, the medium of glass also reflects each lively gesture. 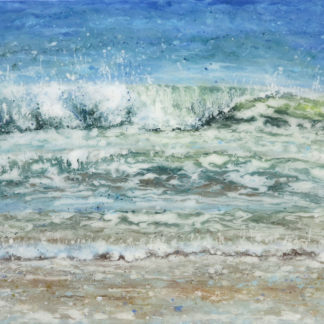 Jane Reeves’ is a leading fused glass painter who has perfected her technique to create stunning seascapes.